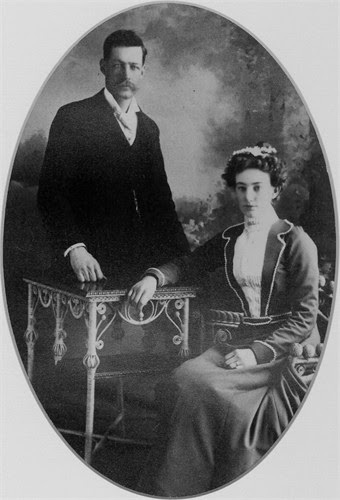 Charles Henry was the middle child of eleven of Mary Tait and Wiiliam Henry, He was the third son and was born on January 27, 1866 in Perth County, Ontario. In 1881, fifteen year old Charles came west with his widowed mother Mary and his ten siblings. The photos in this post were found onlne at ancestry.com, submitted by user SeanMMcDonald from St.Paul, Minnesota. Thank you for sharing. 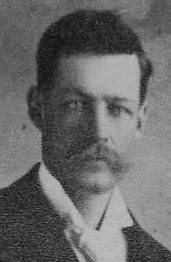 Charles at age 35, married Lillian Chadsey in 1901. She was the 22 year old daughter of very early settlers of western Manitoba, Frank and Margaret Chadsey, originally from Prince Edward County in Ontario. They came to Winnipeg by rail in 1879 and later to what is now the Rivers area. It is said that Lillian was one of the first white babies born in that area in 1881, the same year Charles and his mother and siblings moved from Ontario. "Charlie" was 18 years old when he was able to take out a homestead in 1883 on the quarter straight east of his mother at NE 6-14-21. He and his brothers spent time earning money on the railroad and in bush camps in order to run the farms and make a living. He worked one winter cutting ties for the railroad in the Shell Valley, north of Russell, MB. He was often known as "Sixes Charlie" to distinguish him from his first cousin, son of John and Jennet Henry, with the same name. That Charles Henry met an untimely death in Rapid City in 1898 as the result of a bar room brawl, but that will be the story of a future blog post! He sold his homestead in 1901 to his brother Thomas as he had purchased the east half of section 26-13-22 W1. The 1959 Blanshard history book says his first line of equipment consisted of three horses, two cows, harrows, a walking plow and seeder. Either Charles or his son John Stanley named this farm "Benledi", a good Scottish word meaning a hill overlooking a glen. Charles and Lillian had a family of six. They all lived long successful lives and created legacies of their own. Charles died in 1950 and his wife Lillian 12 years later. They are buried in the Oak River Cemetery.